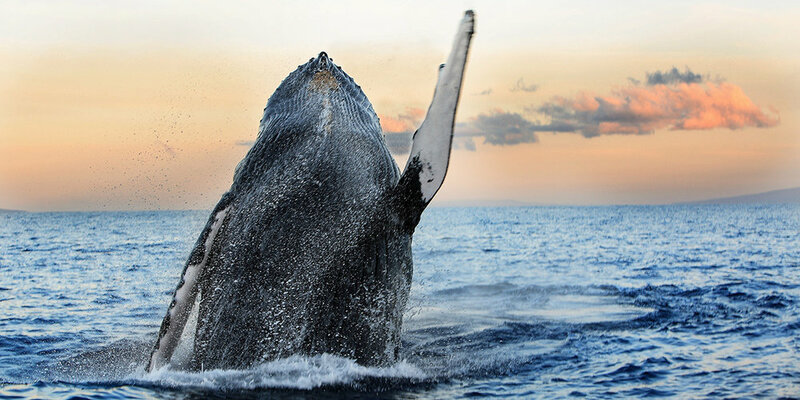 If you're thinking of visiting Hawaii to see humpback whales, there's no better place than Maui. Guests often ask us about the best ways to see these majestic beasts, which migrate to the islands each winter, so we're providing a brief overview here with information and resources to help you get the most sightings possible during your stay. November to May. Each year, thousands of North Pacific Humpback Whales migrate from their chilly feeding grounds in Alaska to the balmy waters off Hawaii to give birth and breed. A smattering of whales first begins arriving in Maui during November, with the population ramping up in December and January before peaking in February. March and April are both good months for whale watching, especially if you want to spot mothers with their new calves. A few stragglers do linger into May, but if you're serious about seeing humpbacks on your visit, stick to January through March when they're most plentiful. North Pacific Humpback Whales are frequently seen in the channel that runs between Maui and the islands of Molokai and Lanai. For those staying in West Maui, that means opportunities to spot whales from shore abound from Kapalua and Kaanapali to Lahaina and beyond. An ocean view condo at The Whaler or Kaanapali Ali‘i is a good choice. The highway from Lahaina to Maalaea (known locally as the Pali) also offers great views of the channel and bay. Just be careful when driving along the coastal roads. Accidents happen each year when drivers who spot whales suddenly stop. So find a safe place to pull over out of traffic (there are even a few observation areas with parking for whale watching), and be mindful of your surroundings. Some areas have steep drop-offs without guardrails that can ruin your day. 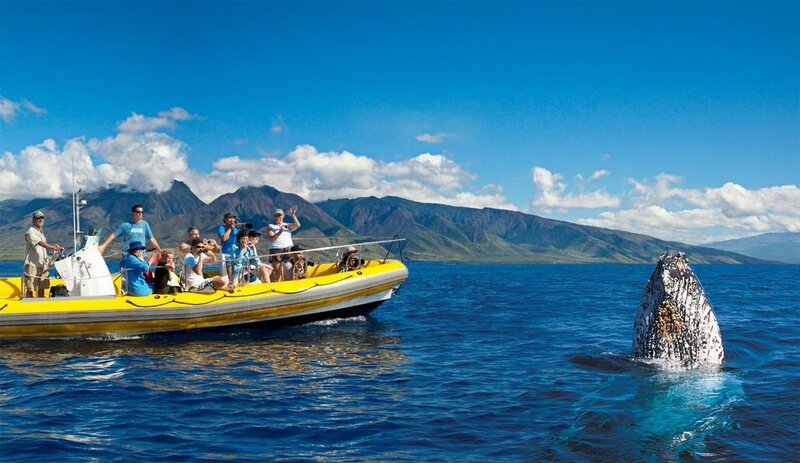 You'll find a range of off-shore whale watching activities leaving from Lahaina and Maalaea harbors, as well as from small boat launches in Kaanapali and Kihei. Offerings include just about any type of whale watching experience, from intimate encounters by canoe or kayak, to small group raft excursions, sailing catamarans, and powered cruises with full bars and catered pupus. For whale watching with experts, try one of PacWhale's Eco-Adventures, led by certified marine naturalists in cooperation with the Pacific Whale Foundation. One of the best places to stay for avid whale watchers is Maalaea. 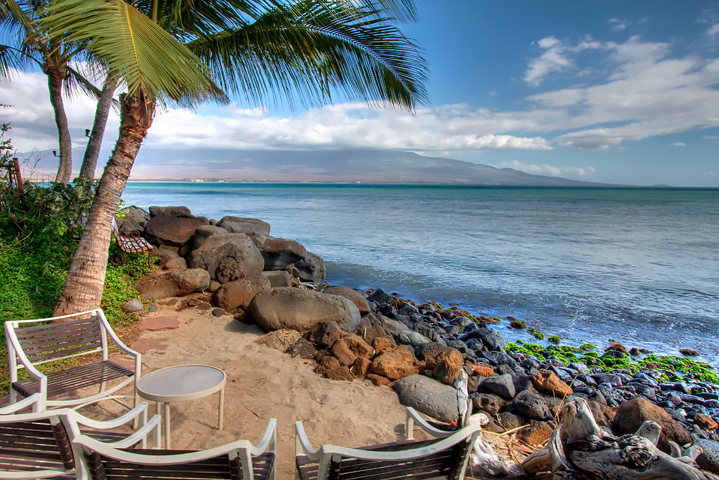 This central Maui community sits beside Maalaea Harbor, the launching point for several whale watching tours. Maalaea is also home to the must-see Maui Ocean Center and Aquarium. Our condo units at the Maalaea Banyans all look out on gorgeous Maalaea Bay, a stretch of calmer waters on the leeward side of Maui that humpbacks visit often. Bring your binoculars if you're staying in one of these units and sip your morning coffee beachside while you watch the whales play. View humpback whales in Maalaea Bay from a waterfront condo at Maalaea Banyans.